You might remember that I recently read and reviewed the book, A Dog's Purpose. In the book, the dog (over the course of several lives and many life lessons) determines (he's a thinker) that he's been ultimately placed on this earth to love and protect his "boy" Ethan. Well, as usually the case after I read something so thought-provoking, I've been wondering about my own pets - how I came to know them, lessons they've taught me, life choices they've influenced - and I can't help but agree with Cameron: There is a purpose. They all (pets, I mean) have a purpose (or many). But unlike in the book (which is fictional), our pets can't spell it out for us; we are left, if we choose, to figure it out on our own. And I, for one, am blown away whenever I make the connection between a pet (not necessarily my own) and a life-road traveled. Take one particular red dog (who, by the way, has a whole tapestry of purposes, but I'm just going to cover one particular thread in this example). I'll start in the present and work my way backwards, so you can clearly see the connection. July 3, 2012: Elizabeth returns her three healthy foster kittens to the Richmond SPCA, so they can be spayed/neutered and placed for adoption. May 25, 2012: Elizabeth picks her three 5-week-old foster kittens up from the (no-kill) Richmond SPCA, freeing up space for three other homeless infant kittens who might not otherwise have survived. Over the course of the last 18 months: Elizabeth is heavily influenced by other bloggers who write about their animal fostering experiences. Spring 2011: Elizabeth first becomes aware (through a blog post at RichmondPetLovers.com, a site she had never visited before starting this blog) of the urgent need for kitten fostering volunteers (during kitten season) at the Richmond SPCA. December 2010: Elizabeth quietly launches The Chronicles of Cardigan with a very silly holiday card. 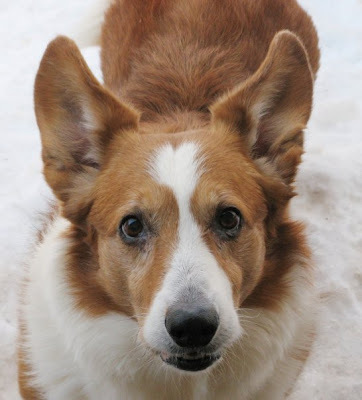 Fall 2010: Elizabeth has a burning desire to write about her experiences with young Jon Farleigh and Dewi, and is influenced and encouraged by the network of other Cardigan Welsh Corgi bloggers, particularly Red Dog Mom at Life with The Horde. March 2010: Elizabeth (and family) meet wee puppy Jon Farleigh, his mama Lucy, daddy Sam, breeder Liz and Sam's human mom, Dina [aka Red Dog Mom] for the first time. January 1, 2010: Jon Farleigh and his five littermates are born to red dog mama, Lucy, and (by proxy) red dog daddy, Sam. Several years prior: Red Dog Mom becomes a "red dog" mom for the first time, with the addition of Sam (JF's future daddy). May 31, 1998: Ch Yardican Roland ROMb (Sam) is born (in Finland - yes, the country). Isn't it amazing how some things work out? A kitten life-saver, he is. What a fantastic legacy Sam leaves behind! I'm very sorry for everyone who must be missing him tonight. He was a handsome boy! RIP Sam - I love that sweet little heart on his forehead!!! Lovely tribute to Sam. Have a good Tuesday! 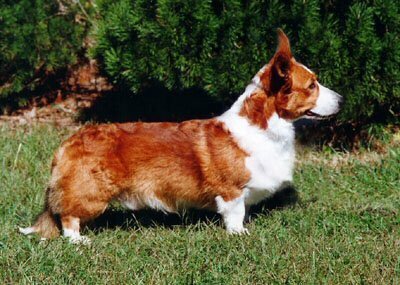 All four of my current dogs are Sam grands or great grands. Thank you Sam for giving me the best dogs ever. Very sweet post. What a handsome boy. Run free at the bridge, Sam. Great Job Guys, this is a nice tribute for Sam! Lovely tribute. Even the animals who don't live with us can change our lives. Elizabeth, I'm soo sorry for your loss of Sam. Such a lovely face. You're doing great things fostering. A wonderful tribute.